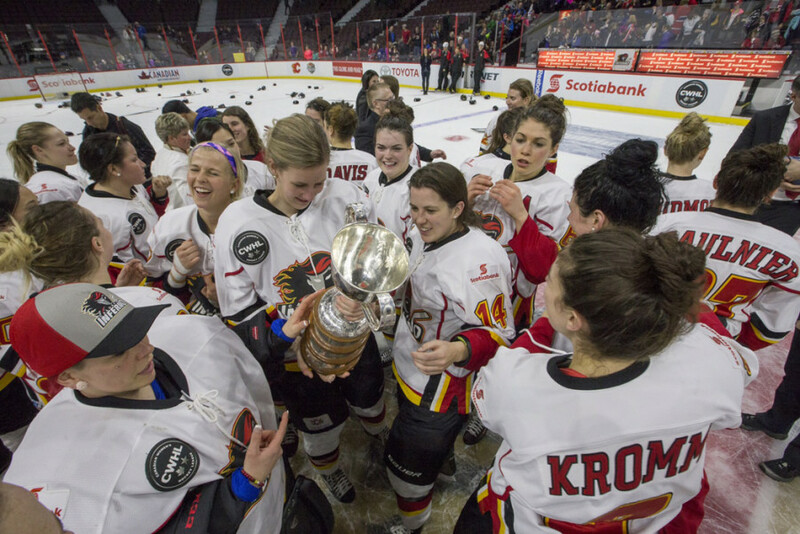 The Calgary Inferno scored early and often as they defeated the Montreal Canadiennes 8-3 in the Canadian Women’s Hockey League Clarkson Cup championship game at Ottawa’s Canadian Tire Centre Sunday afternoon. 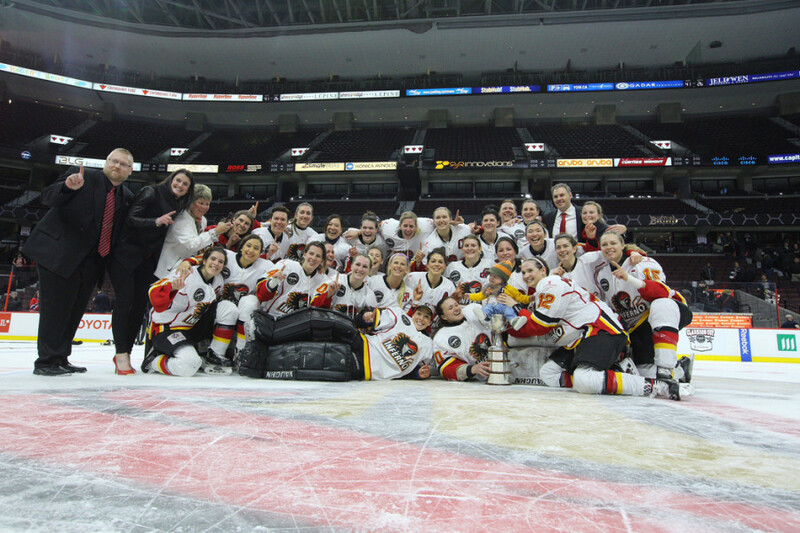 Canadian national team veteran Rebecca Johnston, who missed the majority of the regular season with an injury, and Calgary captain Brianne Jenner each paced the Inferno with two goals and one assist. Rookie forward Blayre Turnbull, veteran Hayley Wickenheiser, and forward Jessica Campbell also joined the multi-point club for Calgary. The Canadiennes got off to a sluggish start and had multiple defensive breakdowns throughout the game, which ultimately resulted in their defeat. Canadiennes goaltender Charline Labonte, too, had a hard time comprehending the outcome of the game. Inferno netminder Delayne Brian was also solid in goal, making 38 saves in the contest. Brian also earned the game’s first star as well as playoff MVP honours. 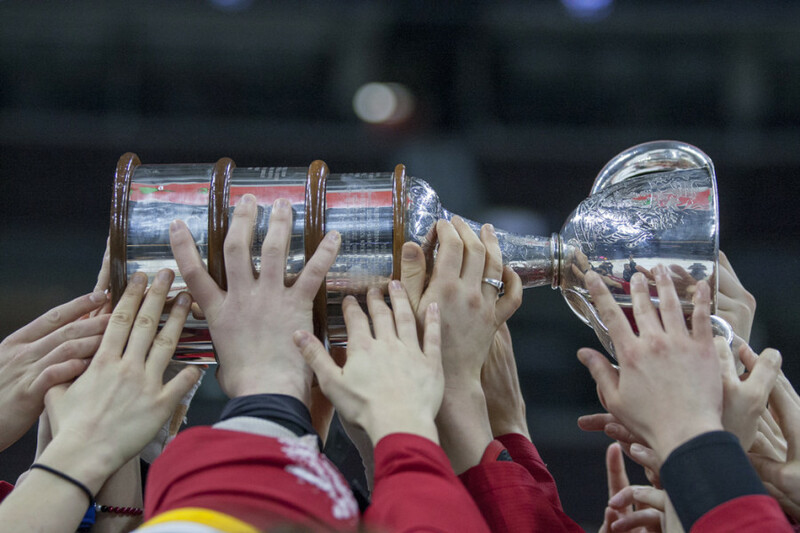 Despite only mustering 26 shots on the opposing net to the Canadiennes’ 41, Calgary made sure to capitalize on their scoring chances, ultimately leading to their success. The Inferno players were proud of the road taken to the title. It was the Inferno that struck first. Inferno forward Rebecca Johnston potted home the rebound of linemate Brianne Jenner’s shot to give Calgary an early 1-0 lead just minutes into the game. The Canadiennes responded on their first power play opportunity. CWHL leading scorer Marie-Philip Poulin directed a backhander towards the Inferno net which trickled through Calgary netminder Delayne Brian. The Inferno increased their lead to 3-1 thanks to Jessica Campbell. Sarah Davis cut through the middle of the ice and took a shot which was initially stopped by Labonte, but Campbell was on the doorstep to convert on the rebound attempt. The damage would only increase when Blayre Turnbull managed to break free from Montreal defenders and sneak a shot through the five-hole of Labonte. Noemie Marin would score to cut Montreal’s deficit to three goals, but any hope of life was immediately extinguished. Wickenheiser feathered a beautiful pass to Turnbull, who made no mistake, connecting on a clean wrister past a helpless Labonte to make it 5-2. Campbell and Johnston would add subsequent markers to make it 7-2 in the third period and Kim Deschenes scored for Montreal in the latter stages of the third period. Canadiennes head coach Dany Brunet to pull Labonte with 5:54 remaining but it was too little too late for any hope of a comeback. While Labonte, who gave up seven goals on 25 shots in the loss, was categorical on her performance. However, her teammates and head coach were quick to deflect the blame away from their Olympic netminder.